We don’t need to tell you that Minnesota winters are frigid. You know they can be downright excruciating, making your home an interior oasis that protects you against the cold—if you have a furnace that’s up for the challenge, that is. Already, this requirement eliminates several types of furnaces from consideration if you live in this great state. So, when it comes time to replace your furnace, what’s the best option to keep your home warm and cozy during the long, winter months? For Minnesota homeowners, it’s natural gas or pass. And here’s why. There are many advantages to choosing a natural gas furnace, especially its high efficiency. Because it’s a natural resource, no secondary energy source is used to power your natural gas unit (or heat your home). In fact, it’s been reported that 95% of natural gas produced and delivered to your home can be used directly by new, energy-efficient appliances, which means less energy wasted. Newer models will, of course, operate more efficiently than older models, so if your home is warming up with the help of a 15-year-old model, it might be time for an upgrade. Our energy-efficient models, like the Trane 95 furnace, have even delivered up to 96.7% efficiency. In addition, natural gas is a cleaner fuel which, according to the U.S. Energy Information Administration, produces fewer carbon emissions than any other fuel source. Electricity, on the other hand, isn’t nearly as efficient. In the past, the American Gas Association has shared that 70% of the energy used to generate electricity is lost, while natural gas loses only about 10% of its useable energy. When the time comes to replace a furnace, the price of the unit and installation are often top concerns for homeowners. It’s a big expenditure, and you want to make sure you get the best bang for your buck. Electric furnaces are typically cheaper upfront. However, they often wind up costing homeowners in climates like Minnesota’s more than natural gas alternatives. Of course, energy costs fluctuate from household to household, but using Lamberty’s conversion as a baseline, you could save $3,520 in monthly energy bills over the course of ten years, just by opting for natural gas. So, while it’s certainly important to consider the cost of the upfront investment in your unit, your monthly spend should be a consideration, too. Minnesotans are all-too-familiar with braving cold temps, scraping ice off windshields, and white-knuckling a steering wheel during a long, slick commute. But all that winter work is worth it when you finally get to hunker down in your warm, cozy home. When you’re trying to relax, the last thing you want to deal with is a loud furnace interrupting your peace or your favorite movie. A variety of factors affect the noise level of a gas furnace, and efficiency is one of them. Generally speaking, higher efficiency means less noise. And, you can get even more quiet from your gas furnace by upgrading the type of unit you get. For example, two-stage gas furnaces operate between the first and second stages on demand, resulting in fewer starts and stops and a quieter sound overall—especially if the unit is running at the lower, first stage. More than just being a quieter option, natural gas furnaces are also reliable. The average lifespan of a gas furnace is 20 years. And, with regular furnace maintenance, your unit could potentially last even longer. Regular maintenance not only preserves your furnace’s lifespan, but also helps prevent it from shutting down in the middle of winter, which is especially important in colder climates. It’s no secret that Minnesota gets cold in the winter—really cold. When it comes to heating your home without breaking the bank, we recommend installing a natural gas furnace. 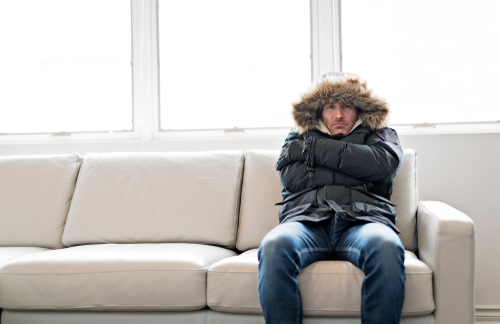 In these extreme temps, natural gas furnaces not only provide warmer temperatures, faster, they also provide higher efficiency, a lower utility bill—and, best of all—a little peace and quiet. At Welter Heating, we specialize in furnace installation and repair for a variety of furnaces for our customers, including natural gas furnaces. So, if we’ve managed to convince you that gas is the way to go, give us a call at 612-825-6867 or contact us to schedule your installation. If you need an emergency repair, our team is on-call 24 hours a day for emergency service during the winter months. Still need more information to make your decision? Read our Gas vs. Electric Furnace Guide.